FTTH, Fiber to the home, you know. It provides the final customer access technology. 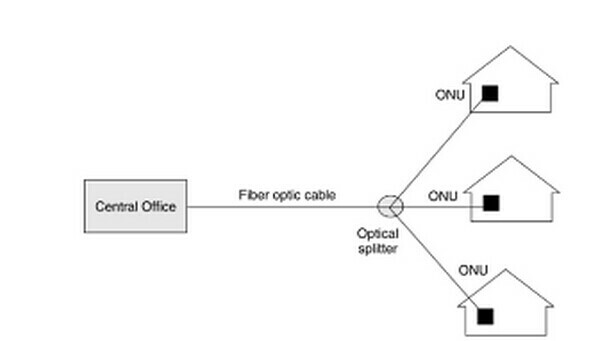 There is a situation that fiber optic cables are extended to the ONU (Optical Network Unit) based on the customer’s premises, it also supply the customer virtually unlimited bandwidth for all the applications such as video, voice and high speed data and the speed can reach up to 1G per customer. Related passive optical product: PLC splitter . And the FTTH is future proof, it becomes the only one technology that can meet the requirements for such high bandwidth, the FTTH architecture is shown at the Figure. We know ONU is required for each client rather than for a group of up to several hundred customers. FTTH is not cost effective at this time, and is dependent upon advances in technology to provide a more cost effective bandwidth on fiber optic cables and effective ONU technology. Well, FTTH will be many people’s preference. We can know after comprehensive knowledge that the easiest way to provide FTTH is to use passive 1:N optical splitter to divide the optical bandwidth roughly equally between the N customers. Alternatively, a single fiber can also apply for both directions od transmission using wavelength division multiplexing (WDM). The splitting of the optical power among many consumers in a PON (Passive Optical Network) has significant optical power budget. Recent years FTTH has some developments, such as a proposal for the creation of a GNDG (gigabit national data grid), it can overcome the bandwidth communications requirements for the future and the proposal also allows the use of the alternative access technologies, already discussed, such as XDSL, coax or wireless to provide service at lower data rates. However, interfacing to such solutions may well cost nearly as much as the final FTTH infrastructure. In fact, WDM with optical splitters or optical amplifiers are the main technologies required to implement such a FTTH network. Now WDM systems can provide bandwidths of 40G per fiber, use 16 wavelengths at 2.5 G each, and hope it can reach 100 rerabits in the next 5 years.